This is a great way to grasp the fundamentals of surfing in a fun and safe way. All you need is a desire to learn and the ability to swim. Surfing lessons include a surfboard and wetsuit (You may use your own gear if you have it). 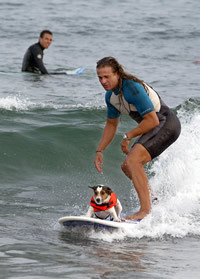 Lesson hours and locations depend on surf conditions and tides, as well as client preferences. Once we arrive at the beach I will run through safety and etiquette tips and brief you on surfing techniques. Then it’s out in the water to surf, wipeouts and have fun! Lesson days may vary depending on the water temperatures based on weather, wind and wave conditions. Rates are $100 per person for a minimum of 2 hours and a max of 2 people at the same time.